What are the best portable RV grills in 2019? If you need a reliable cooking tool, you should consider getting the best portable RV grill. Since it’s an excellent way to cook delicious meals for you and your family, you must look for an excellent model. If you don’t have time to do proper research, you can always rely on our advice. After thoroughly looking at several feedbacks given by other users and experts, along with sales figures, we’ve concluded that one great choice of portable RV grill is the Coleman RoadTrip LXE. This lightweight and compact propane grill is suitable for picnics and camping activities because it features a collapsible design that allows quick and effortless transportation. Moreover, the unit cleans easily due to the porcelain-coated surfaces and the removable grease tray. If the Coleman RoadTrip LXE is out of stock, the second best product is the Magma Products TrailMate. The product can deliver 20.000 BTUs of heat, evenly spread across a generous surface of 285 square inches. It is foldable and easy to carry around and clean, with a removable grease tray. The tray is long and shallow, and the grill has to be leveled perfectly before filling the water tray to prevent spilling. It’s also quite heavy, so you might need help carrying it. The product meets the expectation of most customers, doing what it has been advertised to do. It has good value for the money, but there are some disadvantages which need to be considered. It has a high-quality build and solid construction. It heats up fast, spreading the heat evenly over the whole grilling surface. It can be used in many other applications such as on a boat or when camping. The gas regulator is not very well made, and it can break. Some customers considered the price as being too high for what the product has to offer. The problems with the gas regulator are not so important as the manufacturer offers a warranty and will replace the broken gas regulator without extra expense. The grill offers decent value for the money. 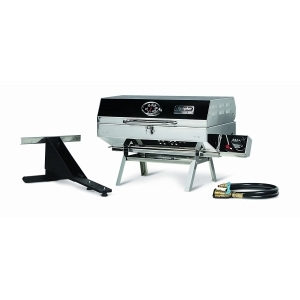 This grill is very durable and robust, being well calibrated for RV low-pressure propane supplies. It offers 180 square inches of cooking surface, and quick connect valves and hoses are included. There are some issues with rust forming too quickly on some components. It might not distribute the heat evenly across the cooking surface, leaving some areas uncovered. Overall, the grill is pretty good for the price, but given the issues it has, proper maintenance and caretaking is recommended. The quick connection system is useful, making it easy to use. Owning and using the best RV grill is extremely beneficial especially if the thing you enjoy most is going camping with your family or friends. Because there are all sorts of models for sale, you might have a hard time deciding on a specific portable grill. Fortunately, we’ve gathered some useful tips and made a short list of features that come in handy in your search for a high-quality RV grill. One essential aspect you need to determine is the type of portable RV grill you’re willing to invest in. Since most products on the market showcase both advantages and disadvantages, it’s logical that you need to understand from the very beginning how often you need to use a camping grill and for what kind of cooking activities. 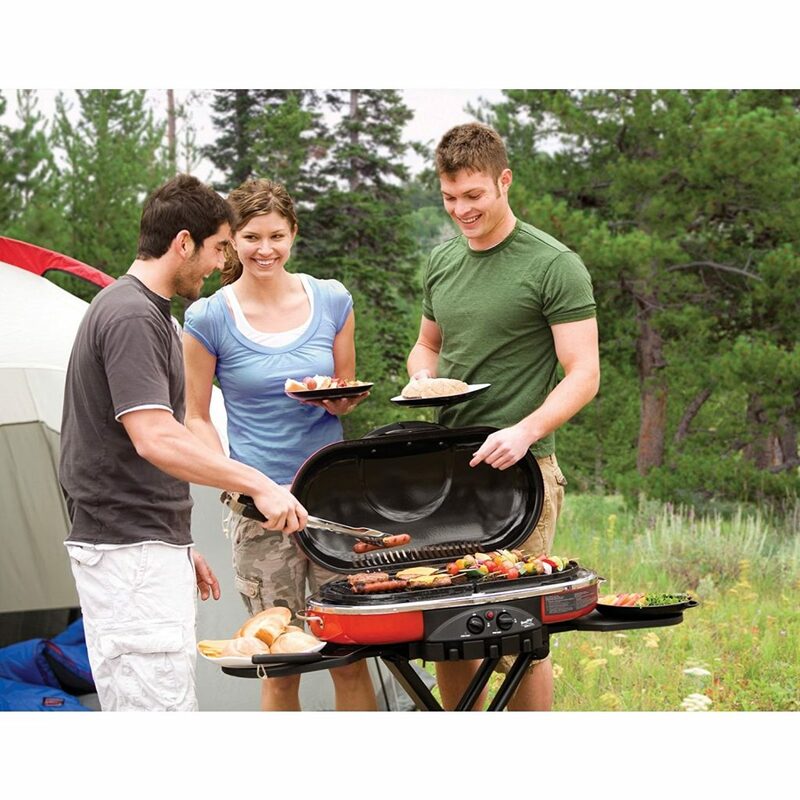 For instance, one good option is the portable charcoal grill, which most camping enthusiasts prefer to use. So it is quite common and easy to come by. You won’t need to spend a lot on charcoal units, but you will have to be prepared to clean them thoroughly after each use. The cleaning process takes a bit of time so you might consider another alternative if you need to cook several dishes at once. A good grill for camping is the propane type that borrows some features from charcoal units but not the cleaning part. You won’t have to ruin your vacation trying to remove greasy things from your RV grill. Plus, this unit comes with excellent heat distribution that can’t be overlooked if you want to cook a delicious roast. Most portable RV grills reviews talk about the importance of lightweight materials and accessories for transporting the units. However, if a product is not so heavy, it could mean that it is a tad flimsy in regards to the quality of construction. Given that you’re dealing with flammable liquids, you need to take safety into account. So, get an RV portable grill that is sturdy and comes with a stand, if possible. Aside from this, check the working area and other surfaces and see if some sharp corners or edges can cut you or snag your clothing items. Look at the handle and test to see if you’ve got enough grip room. Detachable shelves or slides are incredibly useful because they ease your cooking job. Look at other reviews of portable RV grills and see if the model you’re aiming to get can hold a large turkey or at least a plate of food, as well as other utensils you need to make a delicious grilled meal. Camping is an excellent opportunity to show off your cooking talent. If you want to impress your friends or family, you could start by getting a portable RV grill that allows you to cook everything you desire, without having to worry about your meal getting burnt or undercooked. 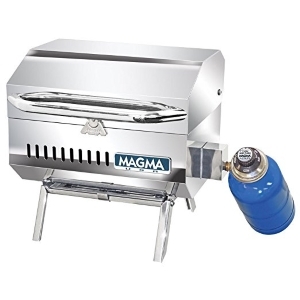 This portable unit is ideal for picnics or camping activities because it delivers 20,000 BTUs of heat across 285 square inches of grilling surface. In other words, you won’t have to wait an eternity for your food to cook. Thanks to the interchangeable cooktops, you can switch the grill grates out of the griddle and stove grates. There’s no need to bring a match or a lighter because this portable RV grill comes with an ‘instastart’ button that instantly ignites the grill. The collapsible design enables fast and easy transportation as well as storage in any car trunks. 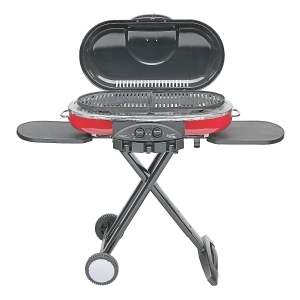 This good-looking compact and portable grill boasts fold-away legs and an inner safety shell. Moreover, the funnels grease located in the front access grease tray reduce the flare-up but also the heat discoloration. The most important feature is that the grill features 100% mirror polished stainless steel that ensures its lasting beauty and maximum corrosion resistance. Because of the convenient snap-out radiant plate, the product provides quick and effortless clean-up, besides the ideal even heat distribution. You can take this grill with you in every outdoor adventure because the foldable legs convert it into a small and practical item that can be transported from one location to another. Furthermore, the grill is fuel efficient because it uses standard, disposable propane canisters. Plus, the swiveling valve is quite useful for changing gas bottles in complete safety. This portable grill is outfitted with an oversized lockable lid that won’t slam shut when in use. If durability is what you’re seeking for, you won’t be disappointed with this portable grill. The unit is specially designed to be used for RV camping trips. Also, it connects to a low-pressure propane supply located on your camping vehicle. One of the most notable features related to this unit is that it includes a mounting bracket that works great for hanging the grill on an RV mounting rail. The folding legs allow you to use the item in a tabletop position. The product comes with a quick connect hose and valve and is equipped with an integral safety shut-off valve that prevents accidental non-ignition fuel discharge. You won’t have to waste precious time with the assembly part because the grill sets up in no time. In addition, the Piezoelectric spark starter lasts for 20,000 starts. The grill is outfitted with a large cooking area of 180 square inches while the iron smoker plate minimizes grease fires.